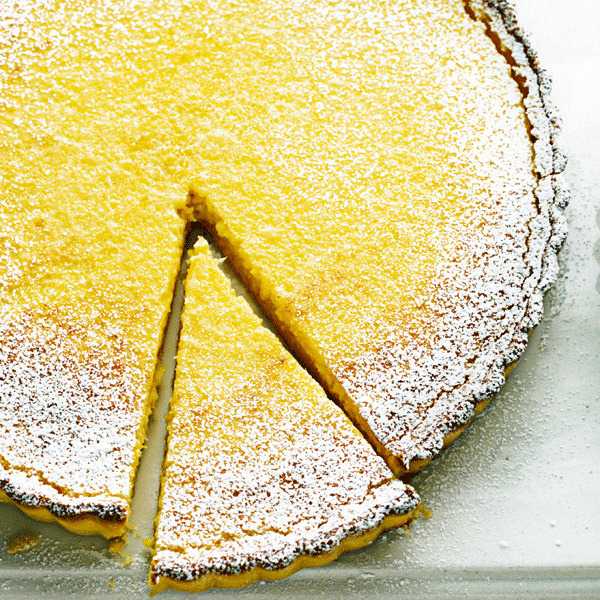 Raymond Blanc’s tart is a treat and one of his favourite recipes. Try adding some ripe figs, cut in half, to the lemon and cream mixture before you bake it. Or serve it as it’s shown on the cover of some of this month’s delicious. magazines – with quartered strawberries. To make the pastry, beat the butter and icing sugar in a large bowl until creamy, then beat in the egg yolks. Add the flour and, with your fingertips, rub it with the butter mixture to get a crumbly texture. Add 1-2 tbsp iced water, quickly mix with a knife, and press to form a ball. Lightly flour a work surface and, using your palms, lightly knead the pastry until blended. Flatten the dough with your palm into a thick disc, wrap in cling film and chill for 30 minutes. Lightly flour the table and roll out the pastry to 2-3mm thick, to fit a 21cm loose-bottomed fluted tart tin that’s 2.5cm deep. Roll the pastry over the rolling pin and unroll over the tin. Lift the dough with one hand and, with the other, gently tuck it into the bottom edge of the mould so it fits tightly. Take a small ball of dough wrapped in cling film and press all around the base of the tart to ensure a complete fit. Cut off the excess pastry with a knife. Prick the pastry base all over and place in the fridge to chill for 30 minutes. Preheat the oven to 180°C/fan160°C/gas 4 and put a baking sheet in the oven to heat up. Line the pastry case with baking paper and fill with baking beans or rice. Bake on the hot baking sheet for 10-15 minutes. Remove the beans and paper, return to the oven and bake for 5 minutes until the pastry is golden. Brush the pastry with the beaten egg and return to the oven for 1 minute. Remove and leave to cool a little before removing from the tin. Turn the oven up to 190°C/fan170°C/gas 5. To make the filling, put the eggs and sugar in a bowl and whisk together. Gently whisk in the cream, lemon zest and juice until just combined, then pour into the case. Cook for 20-25 minutes. Remove and cool for 1 hour. Dust the tart with icing sugar, slice and serve. Double the pastry ingredients and freeze half the dough. You can make the tart a day in advance.